The Delbarton Theater program seeks to introduce students to the art of theater in all its variety, to guide them in developing their craft through a positive and supportive rehearsal process, and to showcase their hard work and talent through performance. Delbarton has an active program in which students can explore all facets of the theater, from scene construction, lighting, and sound to acting, writing, and directing. Delbarton stages three productions each year. Our mainstage company, the Abbey Players, produces a straight play in the fall and a musical in the winter, while the spring season is capped by the Delbarton One-Act Festival, an entirely student-produced festival of one-act plays. 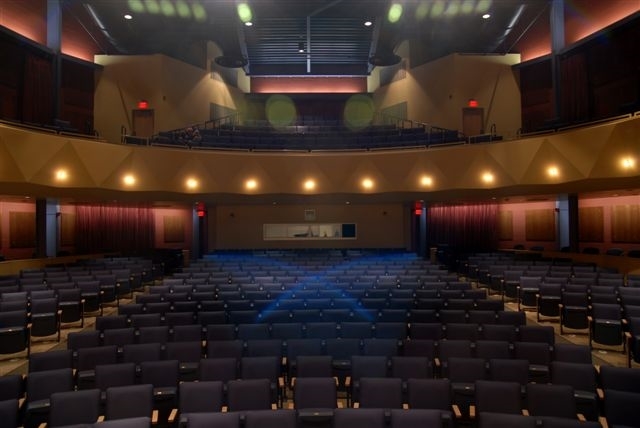 All productions are mounted in the Fine Arts Center Auditorium, a 600-seat theater that opened in 2006. As Delbarton is a boys’ school, we welcome female actors to join our program through open auditions for each production. For more information about the history of Delbarton Theater, our current production, or auditions for our next show, please click below. Join us for the 2019 One Acts Festival, Friday, April 27 at 7:00pm in the Delbarton Fine Arts Center. Tickets are available now. Visit HERE to reserve your tickets today! Auditions for Delbarton Theater productions are open to all Delbarton students grades 7-12 and girls from surrounding schools. Rehearsals typically run from 3-5:30pm, Monday-Friday. Audition requirements vary for each production; materials will be posted on this page prior to auditions. For information regarding auditions or the rehearsal process, contact Director Mr. Matt Corica (mcorica@delbarton.org). Music and Lyrics by Andrew Lippa. Based on the Myths of Ovid, written and originally directed by Mary Zimmerman.